West Southern Pines was one of the first incorporated African American towns in North Carolina. From 1923 to 1931, the town operated with its own mayor, city council, and municipal services. In early 2017 the Southern Oral History Program (SOHP) completed processing a group of twenty-six interviews conducted by Nancy Mason, an oral historian for the Town of Southern Pines. 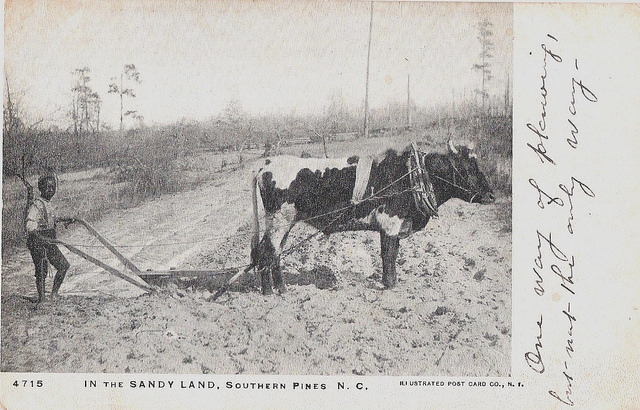 Plowing, Southern Pines 001 From PhC.184 Massengill Postcard Collection, State Archives of North Carolina, Raleigh, NC. Mason spoke mostly with black residents who were old enough to have some memory of the time when West Southern Pines became a separately chartered town and the changes and challenges that accompanied the charter process and the eventual annexation of the town. Mason also spoke with a few white Southern Pines community members who had ties to West Southern Pines. This collection of over two dozen interviews show a picture of a tight knit community. A bulk of each interview consists of Mason and the interviewee discussing which other families and community members they are close with. These interviews also contain a range of complex memories and feelings about West Southern Pines. Interestingly, one major area of contention is about the founding of the area itself. Unraveling the history of “Jimtown” (the colloquial name for the area before it was known as West Southern Pines, and a name that persisted for years after the charter) is a popular topic of conversation. Mason suggested that the “Jim” was local landowner James Henderson, which some residents confirmed. Some had alternate theories that it was actually Jim Bethea, a general store owner. Some speculated that Jimtown is a reference to Jim Crow. 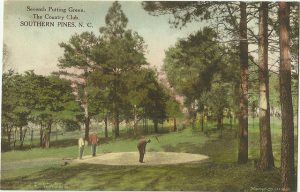 Country Club, Southern Pines, 7th Green From PhC.184 Massengill Postcard Collection, August 2015 addition, State Archives of North Carolina, Raleigh, NC. Other jobs early on in West Southern Pines’ settlement even included building roads, as by the early 1920s most were still dirt paths. Eventually more residents started their own businesses, and as the town grew and became independent there was more of a need for teachers and police. How the charter impacted daily life in West Southern Pines is perceived differently from person to person. James “Rich” McRae, a builder/contractor who moved to West Southern Pines in 1921 from Sneads Grove, N.C., stated that he went to a few town meetings when the Charter was being worked out, but expressed that it didn’t feel that much had changed after West Southern Pines officially became its own town. “Most of the I was off working,” he explained. Other residents grew up in politically active families, and had more recollections about the Charter. Christine Nelson, who was only sixteen at the time of the establishment of the charter, remembered the new presence of black mayors over the next few years. 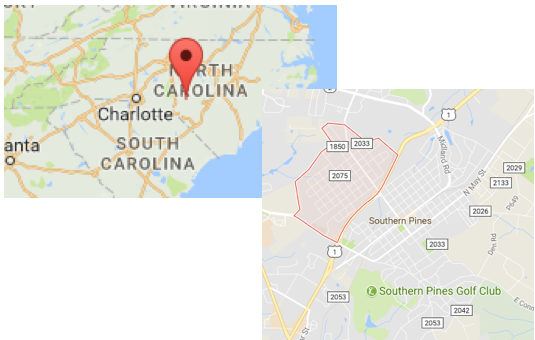 Unfortunately, in the early 1930s West Southern Pines gained the reputation as a violent area. Lifelong West Southern Pine residents largely report that criminals from outside the community would hide out there, and many interviewees cited increasing violence as a big reason that East Southern Pines annexed the West and took back some jurisdiction. Interviewees were split in their opinion about annexation. Fred McIver, who worked variously in farms and resort hotels, stated, “Well, I don’t think it was as bad as it seemed to be; [after annexation there were] more jobs, more people, more houses.” To others, a hard-fought dream had been achieved, but taken away in less than a decade. While the interviews largely focused on the years during the charter and the charter’s political and economic impact, interviewees also remembered the “slice of life” details: school, church, shopping, and nightlife. The Great Depression hit hard in the 1930s, and some residents spoke about scarcity, federal assistance, and neighbors helping neighbors. Dramatic events, like the tornado of 1920, or an infamous murder that took place at the local “piccolo” (theater/nightclub), owned by Amos Broadway. Donnie Wicker remembered how the older women in the community knew herbal remedies, and would be consulted before going to the doctor across town. The civic club was a popular community gathering spot, and a E.J. Austin, a white Southern Pines councilman, noted the force of the Civic Club and other institutions in West Southern Pines to unite residents and impact votes. The West Southern Pines Civic Club was instituted after the charter had been lifted, and represented churches, businesses, and smaller social clubs. Mason concluded most of the interviews by inviting the interviewee to talk about whether West Southern Pines had been a good place to live, and the changes that have occurred over the years.